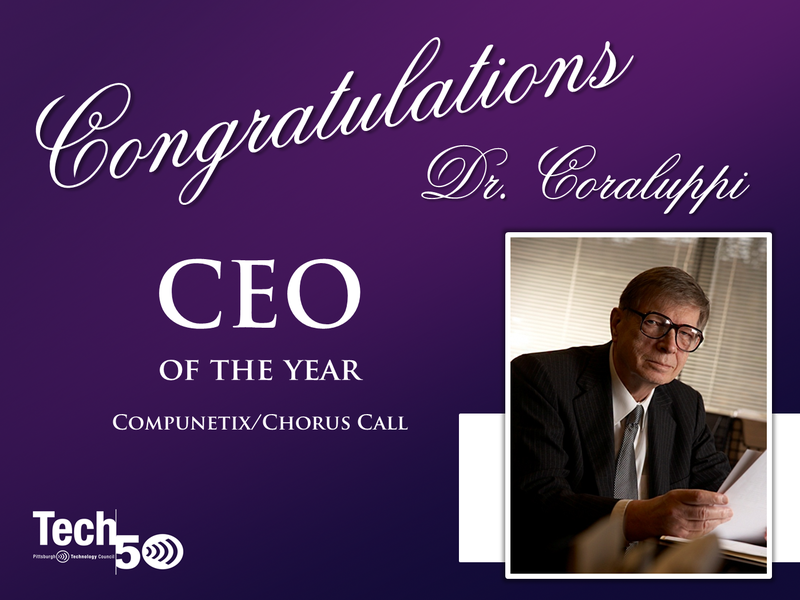 Congratulations Dr. Coraluppi – Tech 50 CEO of the Year! The Pittsburgh Technology Council announced the winners of the seventeenth annual Tech 50 awards last evening at the gala held at the Wyndham Grand Pittsburgh Downtown. This year’s gala, 2013 Tech 50 Spotlight: A Celebration of Innovation in Pittsburgh, highlighted the transformative technology centers of excellence with tech companies at all stages of growth. Dr. Giorgio Coraluppi, President and CEO of Compunetix and Chorus Call, was named the Tech 50 CEO of the Year for his innovative spirit and vital contributions to the Pittsburgh technology community since 1964. Congratulations Dr. Coraluppi! To read more about the awards, visit the Tech Council’s blog, the Pittsburgh Post-Gazette, and TribLIVE.